Anna Hagele, Author at Where's Eli Moore? This time, Eli finds himself somewhere in the Earth’s Eastern Hemisphere. Think you know the answer to the clue? Where IS Eli Moore? Take a guess! Eli’s third adventure takes place in an island country. Hey there, everyone! June passed by in a blur of swimming and hot afternoons. July is upon us! Here is the next installment of my hike up Paintbrush Canyon in the Grand Tetons. After seeing the moose, I started back up the canyon. In and out of forest, through sagebrush and rock, out into open vistas then back under the pines, walking over hushed, pine needle-carpeted ground. On and on, I walked. This was one thing I loved about hiking. The pace of it. The steady step of it. I settled into my step and wondered at each new view. I slowly fell into that mindful, yet mindless state that comes when you are hiking miles alone. I was mindful of all the new beauty I was seeing, letting it sink into my soul to retrieve later on some dark day when I would need the memory. Yet, specific thoughts were driven away from my mind. My conscious mind became absorbed in simple things, the motion of walking, the feel of my pack on my back, the deep quiet of a world left untouched, innocent of human habitation. I felt small, menial, silly in such a large world. I was content to merely follow the path, one step at a time. After about four miles, I came finally to Holly Lake. It was located just below the pass, a beautiful alpine lake surrounded by green and grey cliffs marked with patches of snow. I thought that most of the snow would be melted up here since it was August, but there were definitely still patches remaining. Looking up the trail towards the pass, I could see more snow ahead. I frowned. I sat down on a rock next to the lake and pulled out my peanut butter and jelly sandwich, staring into the cold depths of the mountain lake. The lake was still and reflected the sky and cliffs creating an optical illusion of endless sky and endless cliffs. I picked up a small rock and threw it into the lake, watching the illusion melt into concentric rings rippling across the surface of the lake. When I threw the rock, I stood up and put my sandwich down beside me. Just as I was sitting back down, I heard a strange twittering noise directly behind me. I turned to see an odd, rodent-like creature creeping up towards my sandwich. “Ah! Get!” I said, grabbing my sandwich possessively. “Marmots!” I mumbled under my breath. Marmots are a large, squirrel-like creature. They look a lot like woodchucks or groundhogs, but they live high up in the mountains. They are known to beg for and occasionally scamper off with lunches. This little guy was pretty brave. He ran away when I got after him, but then came back towards the rock, sitting back on his hind legs, his big, fat belly sticking out. He looked at me with curiosity. I laughed at him and then threw him the last bit of my sandwich. “I shouldn’t encourage you, but I guess you’ve already figured out this is a pretty good place to catch a quick meal.” The marmot grabbed the last of my sandwich between his hands and started nibbling happily. I watched him finish it off and then pulled my pack onto my back. “See ya, buddy! I’ve got snow to navigate.” I started back on the trail. I was nervous about the snow. I hadn’t brought any sort of crampons or snow axe. It looked like the snow was fairly thin, though, and that the path went pretty straight over the pass. I shrugged and kept moving. I was soon walking through the pass and feeling pretty pleased with myself. Peaks stretched above me on either side, but I was managing the snow, careful to dig my feet in with each step. I would soon be heading down and the snow would thin out. I was totally confident that everything would be just fine. I came out of the pass and started down. For a while, the snow seemed to be clearing. Then, almost out of nowhere, a huge, slanted snowfield appeared. I winced. The path wasn’t very clear, but cut through the snow at an angle. The snow itself was a bit more like ice than snow because it had been melted in the summer sun and then frozen again during the high altitude nights. This process of melting and freezing made for a treacherous-looking trail ahead. I looked down at my hiking boots. They were good boots with strong tread. I looked up at the snowfield ahead. Maybe not that good of tread. I frowned again. All of this snow is supposed to be melted in August. I kept returning to this idea even though obviously the mountains didn’t always follow the rules of what was “supposed” to happen. I had already walked close to 10 miles. I only had about 6 left. It just didn’t make sense to turn around now. If I did, there was a chance I wouldn’t even make it back to the trail head by nightfall and I definitely didn’t want to be hiking around out here after dark by myself. Finally, after minutes of indecision, I grunted, shook my head and started out along the slippery trail. I went slowly, carefully placing one foot in front of the other. If I had brought a snow axe, I could have just used it to steady myself and dig into the snow as I walked. If I had brought crampons (little metal spikes that you attach to your boots), I could have dug in easily and firmly into the snow with my feet. But, I had neither, so I went slow. I made it about halfway through the snowfield. Then, I slipped. It wasn’t some great horrendous fall, just a slip, a small misstep on the ice and slush and snow. Down I went. I tried to stop myself, but the snow was so slick and the mountain side steep. I began to gather speed. Panic raced through my mind as the bright white snowfield surrounded me. I was slipping away faster and faster down the mountain. Suddenly, I remembered the alpine hiking course I had taken early on in the summer. If you do fall in the snow, you should turn and face the mountain and dig in with your hands and feet, like a cat. I quickly turned myself towards the snow which felt honestly like a terrible idea and arched my back, grabbing the mountainside with my hands and kicking it with my feet. I slid a few more feet and then, miraculously, stopped sliding! “Ha! Ha, ha!” I cried out. It had worked! I was no longer slipping down into oblivion! Then, as the icy snow began to burn my fingers, I looked around. I was still in the middle of the snowfield with no way of getting to dry ground. I looked above me. I could see the marks of where my body had slid along the snow. That way was no good. The snow was too slippery for me to try climbing back up to the trail. The alpine hiking course had prepared me for stopping my slide down the snow. It had not told me what I was supposed to do next. Okay, that’s it for the July installment. Hang in for the third and final part of my Teton adventure! Feel free to tell me about some of your adventures here on the website. Hey, there, all of you Eli Moore fans! Now that Eli’s adventure at Carlsbad Caverns is out, I’ve been working hard on his future travel plans. The rough draft of the third manuscript is complete and I am starting on the editing process. For now, however, I thought I would share one of my own adventures with you all. This one took place about 17 years ago when I was working at Grand Tetons National Park in Wyoming. I worked as a front desk clerk there for a summer. I spent shifts checking people in and out of cabins five days a week. The rest of the time, I went exploring. I am breaking this adventure up into three segments, so I hope you enjoy the first one! It was August. The sun was high and hot at Grand Tetons National Park. I started out early that day, before 7 am, because I wanted to climb up through Paintbrush Canyon up over Paintbrush Divide and back down again into Cascade Canyon. It was an ambitious hike especially since I had only started mountain hiking in June. I grew up in the Midwest, in Iowa, where the land is flat and low. The first hike I went on in the Grand Tetons nearly destroyed me simply because of the altitude. But, after two months of consistent sojourning out into the Teton wilderness, I felt foolishly confident. Not only was this the longest hike I had tried, it was also going to be a solo hike. I strapped on my backpack which carried sunscreen, a peanut butter and jelly sandwich, potato chips, an apple, and a few granola bars along with two large water bottles. My hiking boots were laced up tight. I was thankful for the boots. Early on in the summer, I had made the rookie mistake of getting a pair of hiking boots that were just a tad too small for my feet. The end result was such a terrible blister on my pinky toe that I actually lost the entire toenail. I discovered on that particular trip that your hands and feet swell a bit when walking long distances (especially up a mountain) from the blood pumping through them. So, I learned my lesson, got a pair of hiking boots that were just a tad too big for my feet and no longer had to worry about blisters. I drove a half hour to Jenny Lake Lodge, locked my car door, and started off on the String Lake Trailhead which would lead me to the Paintbrush Canyon Trail. The day was perfect. Bright and blue and hot. The trail steadily wound upward and I braced myself for a long day ahead. The further up I went into the canyon, the cooler the air got, but the sun was warm enough so that I didn’t need my sweatshirt. The morning hike was primarily low and wet, in a bit of a marshy area around the lakes. At first, there were quite a few hikers, but after veering off away from the String Lake trail and onto the canyon trail, hiker traffic slowed. There were a few lonely hikers here and there, but mostly I was alone. I came to a forest pond fed by a stream coming down from higher up the peak. The path skirted the pond and I followed it around watching the water bugs jump and skip over the brown and green water. Then, suddenly, I noticed a much larger form of wildlife standing further down in the shallow end of the pond. Two giant male moose were standing completely still, staring at each other. Then, one snorted and pawed the ground. They ran toward each other in a fierce rage, their long antlers locking. I immediately crouched down and moved further away from them, watching their battle cautiously. I glimpsed a female moose, waiting in the brush beside the pond, also watching. “Here, you can see better from here!” A voice came out of nowhere at me. I jumped, not expecting to see another person. There, to my left, crouched down behind the brush, was a middle-aged man pointing his camera at the three moose. I sat down next to him. “Wow! Have you ever seen this before?” I asked. The man shook his head, but did not reply. The two male moose continued to battle. They would come together and break off again, catching their breath between each match. Water sprayed high into the air around them, their feet still ankle-deep in the pond. The hiker beside me clicked and clicked and adjusted his camera. My small, disposable camera was in my pocket, but I did not touch it. I didn’t want to look away. I wanted to remember every single breathtaking moment of it. I wanted the image of those two moose fighting in the wild before me to be burned into my mind, not onto film. One of the male moose was obviously older and larger than the other. After four or five clashes, the young male ran off, bawling as he went, disappointed by his failure. The larger male huffed at him as if to say “good riddance” and then proceeded to prance and dance in the pond, lifting his head and legs and leaping in a circle. I laughed aloud. The other hiker glared at me, but I couldn’t help it. The winner’s happy celebration was infectious. Then, he ran off with his female, away from the pond and deeper into the forest. I left the other hiker to his camera and gave praise for my incredible luck. What a find! Very few people have a chance to come upon such a scene in the wild and I just happened along, an unexpected witness to a moose-mating-water-dance. I laughed aloud again. I probably should have stopped then, just accepted my good fortune, turned back around, and arrived back to my dorm by lunch. But, I had made the plan of the hike and the promise of the high pass lured me on. Had I known what adventures waited on the trail ahead, I may have stopped with the moose. Feel free to tell me about one of your own adventures. I would love to hear about your wildlife finds! The location of Eli’s next adventure is famous for one particular kind of nocturnal animal. Think you might know the location of the next book? Reply to this post with your guess and see if you are right! So, it happened this week. All four of my kids packed up their backpacks and school supplies and braved the great big world of school. The youngest of the bunch – my bubbly, giggly little girl – is in the middle of her first week of kindergarten while the oldest – my quiet, conscientious son – is stepping awkwardly into seventh grade. My second son who is in fifth grade has discovered somewhat overnight that being organized is a good thing (teachers ARE awesome!) and my second grader announced to me yesterday that “math is the best!” Yep, things are up and running and, so far, so good. And I, for the first time in like 13 years, actually have a rather large space of time ALL TO MYSELF. Don’t get me wrong, there is still plenty to do. As any parent of any child knows, even when you aren’t actually with your kids, you are still thinking about them, planning and preparing for them because, you know, that’s what you do when you have kids. But, I feel like I have a little more breathing room to organize, to plan, to breathe, and especially to write!! I also have found a bit more time to go for walks. My activity of choice has always been swimming or hiking, but a very close second is a nice, simple walk around the block. The act of walking can clear your head and calm your emotions and open you up, somehow. Here in Santa Fe, I especially love walking because the sky is almost always so blue. Now, you might tell me that the sky is blue everywhere and I would agree, but there is something about the brightness of the blue in the Santa Fe sky that takes your breath away and makes you feel like the sky is close enough to touch. So, once I drop everyone off at school, I take a walk under the bright blue Santa Fe sky, usually just around the block a few times. When I walk around that block, thinking about the day and wondering about cross country practices, kindergarten drop off procedures, and upcoming fifth grade book reports, I also let a memory or two slip in. These memories are of my kids when they were little. You see, I can remember taking each one, as soon as they could walk, for a stroll around the block to introduce them to their neighborhood. I have rounded the first corner with each child and allowed them to greet Big Old Tree. He is a fabulously old, giant variety of cypress who has survived the desert climate long enough to grow to a dazzling height, especially from the perspective of a 1-year-old. Each child has given him a hug and smelled his dusty, earthy bark and felt the sticky sap that leaks out from the large knot on the side of his trunk. Then, round the other side of the block, at the point farthest from our house, there is a long row of bushes on the left and an equally long fence on the right. Sometime in the midst of our many walks, the kids started to call this the “time tunnel”. I don’t know who came up with the idea in the first place, but it is now a tradition. We run through the time tunnel and come out the other side to find that the mountain ravens have turned into pteranodons and the stray cat crossing the road is a velociraptor. In the summer, there are lizards speeding under the bushes that you can catch if you are quick enough and the occasional giant yellow swallowtail butterfly that flies just over your head. These are followed in the fall by dozens of grasshoppers, some huge and bright green, others small and brown and ferocious looking. By winter, all the little creatures have disappeared and there is ice in the time tunnel. You have to waddle your way through it like a penguin. Then spring comes with its red ladybugs and curious ants that crawl underneath your feet and the happy promise of summer rushes to you once more. And as I walk now around the block, a hundred memories rush by me of walking with my children. When they were very young, everything they encountered was new and wonderful. Then, as they got older, they began to observe, examine, consider, imagine. And I had the great privilege of seeing it all through their eyes, seeing the great magic that one small neighborhood block could hold. I think about how it is probably designed this way – that we old, hardened parents can reawaken our minds through the eyes of our little ones. Then, I think finally about how my children and I are not alone. How over and over and over again, a person somewhere out in the world has taken a walk and found wonder, beauty, peace. What is it about even the smallest of nature’s wonders that draws us, calls to us, speaks to us from the time we are babes to the time we are aged, always repeating, always rediscovering, always reawakening? So, I think I will go one more time round the block. It is still summer, after all, and I can look for lizards and butterflies and the grasshoppers will be coming soon. Please feel free to add your own adventures, photographs and sketches to the website by clicking on Submit Post. The location of Eli’s next adventure has a year round temperature of 56° F (13°C). Do you know a kid who likes adventures and is crazy about animals? 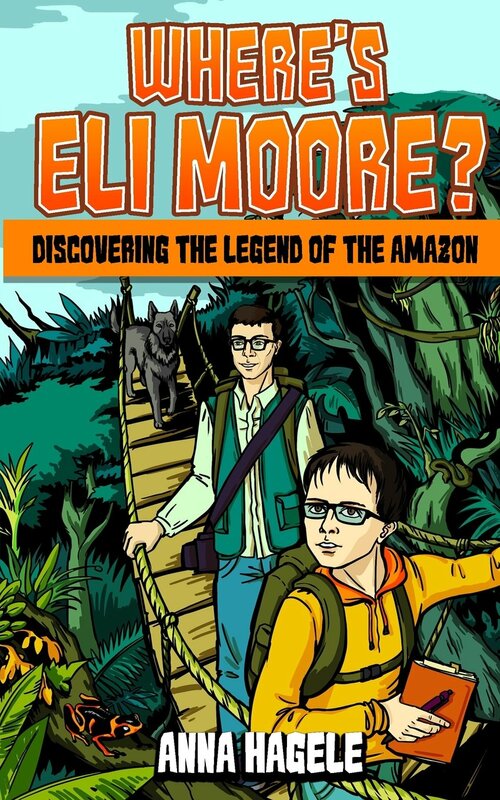 Follow Eli as he travels through the Amazon jungle with his awkward dad and his intelligent dog, Kara. Join him as he sketches in his field journal and encounters an old, spooky Amazon legend. Don’t miss the adventure! Eli’s next adventure happens in a place that is part of both a desert and a mountain range.